DETROIT-April 9, 2011- The creation of a new "signature space" for Cobo Center, in the form of a spacious three-story glass atrium that links the main floor of the venue with a new entrance facing the Detroit River, began in earnest at 10:00am last Thursday when construction cranes began tearing into the concrete and glass between the adjacent arena and current exhibit hall area. 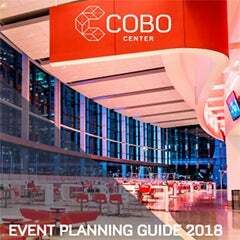 When completed, the atrium area will bring the lower-level exhibition space more naturally into the flow of a meeting or convention and link Cobo Center more fully to Detroit's revitalized riverfront. "Today's the day when the caterpillar officially enters its cocoon and begins its transformation into a butterfly," said Detroit Regional Convention Facility Authority Board Chair Larry Alexander. "When complete, this area will be the most visually dramatic and breathtaking manifestation of physical change to the facility." 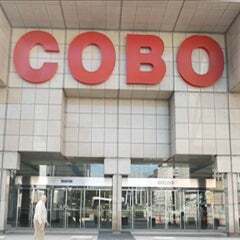 ""During this heavy construction period, our current plan will allow us to operate at near maximum capacity," explained Cobo General Manager Thom Connors. "Improvements will begin in other areas as new space is completed and brought on line, enabling us to maintain our existing base of annual events while booking new events as well." 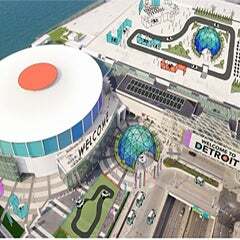 The Detroit Regional Convention Facility Authority (DRCFA) was created in 2009 to operate Cobo Center in Detroit under long-term lease from the City of Detroit. The DRCFA Board of Directors is comprised of five representatives selected by the Governor of Michigan, the Mayor of Detroit, and the county executives of Wayne, Oakland and Macomb Counties. The DRCFA receives funding from revenues at Cobo Center as well as support from the state's Convention Fund. For more information, visit the Authority's Web site at www.DRCFA.org.